رحمانی, علیرضا, شعبانلو, امیر, مجیدی, صبا, طرلانی آذز, منیره, مهرعلی پور, جمال. (1394). بررسی کارایی فرایند ازن/ پرسولفات در حذف آنتی‌بیوتیک سیپروفلوکساسین از پساب صنایع دارویی. مجله آب و فاضلاب, 27(1), 40-48. 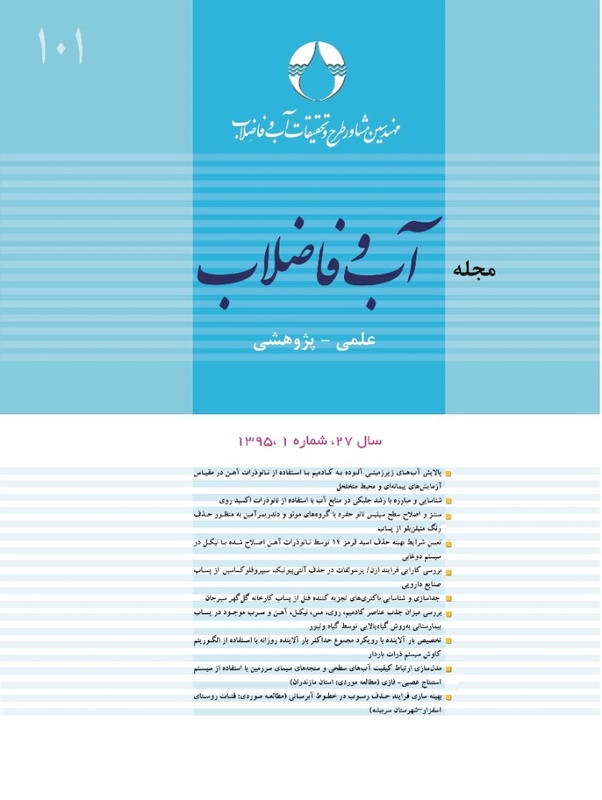 علیرضا رحمانی; امیر شعبانلو; صبا مجیدی; منیره طرلانی آذز; جمال مهرعلی پور. "بررسی کارایی فرایند ازن/ پرسولفات در حذف آنتی‌بیوتیک سیپروفلوکساسین از پساب صنایع دارویی". مجله آب و فاضلاب, 27, 1, 1394, 40-48. رحمانی, علیرضا, شعبانلو, امیر, مجیدی, صبا, طرلانی آذز, منیره, مهرعلی پور, جمال. (1394). 'بررسی کارایی فرایند ازن/ پرسولفات در حذف آنتی‌بیوتیک سیپروفلوکساسین از پساب صنایع دارویی', مجله آب و فاضلاب, 27(1), pp. 40-48. رحمانی, علیرضا, شعبانلو, امیر, مجیدی, صبا, طرلانی آذز, منیره, مهرعلی پور, جمال. بررسی کارایی فرایند ازن/ پرسولفات در حذف آنتی‌بیوتیک سیپروفلوکساسین از پساب صنایع دارویی. مجله آب و فاضلاب, 1394; 27(1): 40-48. حضور پساب‌های حاوی ترکیبات آنتی بیوتیکی مانند پساب صنعت داروسازی از مشکلات جدی در رابطه با آلودگی محیط زیست به حساب می‌آید. فرایند ازن/ پرسولفات، فرایندی نو ظهور در حذف آلاینده‌های مقاوم در برابر تصفیه متداول است. این فرایند با بهره‌گیری از رادیکال آزاد سولفات به‌عنوان اکسید کننده قوی، کارایی بالایی در حذف آلاینده‌های مقاوم دارد. در این مطالعه تجربی، کارایی این فرایند در حضور آنتی بیوتیک سیپروفلوکساسین با غلظت 10تا 100 میلی‌گرم در لیتر در حضور صفر تا 15 میلی مولار پرسولفات در مدت زمان واکنش 30 دقیقه در راکتور نیمه پیوسته با حجم مفید یک لیتر بررسی شد. نتایج نشان می‌دهد که در شرایط بهینه بهره‌برداری شامل : pH برابر 3، دز پرسولفات برابر 10 میلی مولار، دز ازن برابر 1 گرم در ساعت و غلظت اولیه آنتی بیوتیک برابر 10 میلی‌گرم در لیتر، این فرایند قادر است 96 درصد از آنتی‌بیوتیک سیپروفلوکساسین را حذف نماید. با تغییر در شرایط آزمایش، راندمان فرایند تغییر می‌کند. نتایج حاصل از این مطالعه نشان داد، فرایند ازن/ پرسولفات، می‌تواند یک فرایند مناسب برای حذف آلاینده‌های مقاوم و دیر تجزیه‌پذیر باشد. A newly emerging environmental problem is the discharge of pharmaceutical effluents containing antibiotic compounds. Compared to common methods, the ozone/persulfate process is a novel measure for treating persistent pollutants. This process is highly efficient in removing pollutants by using the free radicals of sulfates as powerful oxidants. In this study, a semi-continuous reactor with a useful volume of 1 L was used to evaluate the performance of the ozone/persulfate process in treating the ciprofloxacin antibiotic at concentrations from 10 to 100 mg/L in the presence of 0 to 15 mM of persulfate in 30 min. The results showed that under the optimized operating conditions of pH = 3, persulfate dose = 10 mM, ozone dose = 1 g/h, and an initial antibiotic concentration of 10 mg/L, this method was capable of removing 96% of the contaminant. Moreover, the efficiency of the process was found to be a function of experimental conditions. Based on the results of this study, it may be concluded that the ozone/persulfate process can be considered as an appropriate process for treating persistent and non-biodegradable pollutants. 1. Levy, S.B. (2002). The antibiotic paradox, Da Capo Press, USA. 2. Carrasquillo, A.J., Bruland, G. L., Mackay, A.A., and Vasudevan, D. (2008). “Sorption of ciprofloxacin and oxytetracycline zwitterions to soils and soil minerals: Influence of compound structure.” Environmental Science and Technology, 42(20), 7634-7642. 3. Ji, Y., Ferronato, C., Salvador, A., Yang, X., and Chovelon, J.M. (2014). “Degradation of ciprofloxacin and sulfamethoxazole by ferrous-activated persulfate: Implications for remediation of groundwater contaminated by antibiotics.” Science of the Total Environment, 472, 800-808. 4. Capriotti, A.L., Cavaliera, Ch., Piovesana, S., Samperi, R., and Legana, A. (2012). “Multiclass screening method based on solvent extraction and liquid chromatography–tandem mass spectrometry for the determination of antimicrobials and mycotoxins in egg.” J. of Chromatography A, 1268, 84-90. 5. Peng, H., Pan, B., Wu, M., Liu, Y., Zhang, D., and Xing, B. (2012). “Adsorption of ofloxacin and norfloxacin on carbon nanotubes: Hydrophobicity-and structure-controlled process.” J. of Hazardous Materials, 233, 89-96. 6. LaPara, T.M., Burch, T.R., Macnamara, P. J., Tan, D.T., Yan, M., and Eichmiller, J.J. (2011). “Tertiary-treated municipal wastewater is a significant point source of antibiotic resistance genes into Duluth-Superior Harbor.” Environmental Science and Technology, 45(22), 9543-9549. 7. Watkinson, A., Murby, E., and Costanzo, S. (2007). “Removal of antibiotics in conventional and advanced wastewater treatment: Implications for environmental discharge and wastewater recycling.” Water Research, 41(18), 4164-4176. 8. Li, Z. (2011). “A mechanistic study of ciprofloxacin removal by kaolinite.” Colloids and Surfaces B: Biointerfaces, 88(1), 339-344. 9. Gu, C. (2007). “Complexation of the antibiotic tetracycline with humic acid.” Chemosphere, 66(8), 1494-1501. 10. Wei, R. (2011). “Occurrence of veterinary antibiotics in animal wastewater and surface water around farms in Jiangsu Province, China.” Chemosphere, 82(10), 1408-1414. 11. De Bel, E., Dewulf, J., De Witte, B., Van Langenhove, H., and Janssen, C. (2009). “Influence of pH on the sonolysis of ciprofloxacin: Biodegradability, ecotoxicity and antibiotic activity of its degradation products.” Chemosphere, 77(2), 291-295. 12. Bobu, M., Yediler, A., Siminiceanu, I., and Schulte Hostede, S. (2008). “Degradation studies of ciprofloxacin on a pillared iron catalyst.” Applied Catalysis B: Environmental, 83(1), 15-23. 13. Gad-Allah, T.A., Ali, M.E., and Badawy, M.I. (2011). “Photocatalytic oxidation of ciprofloxacin under simulated sunlight.” J.of Hazardous Materials, 186 (1), 751-755. 14. Matilainen, A., and Sillanpää, M. (2010). “Removal of natural organic matter from drinking water by advanced oxidation processes.” Chemosphere, 80(4), 351-365. 15. Manhal, A., Regis, O., Driss, M., Florence, P., Bertrand, G., Vel Leiten, N. K., and Baukari, S. (2012). “An optimal control of a wastewater treatment reactor by catalytic ozonation.” Control Engineering Practice., 21(1), 105-112. 16. Adedapo, R. (2005). “Disinfection by-product formation in drinking water treated with chlorine following UV photolysis and UV/H2O2.” Thesis Presented to the University of Waterloo, Ontario, Canada. 17. Busca, G., and Berardinelli, S. (2008). “Technologies for the removal of phenol from fluid stream: A short review of recent developments.” J. of Hazardous Material, 160, 268-288. 18. Fernando, J.B., Francisco, J.R., and Ramon, M.E. (2009). “Catalytic ozonation of oxalic acid in an aqueous TiO2 slurry reactor.” Appl Catal B: Environmental, 39, 221-231. 19. Laisheng, L., Wanpeng, Z., and Pengyi, Z. (2007). “UV/O3-BAC Process for removing organic pollutants in secondary effluents.” Desalination, 207, 114-124. 20. Lucas, M.S., Peres, J.A., and Puma, G.L. (2010). “Treatment of winery wastewater by ozone-based advanced oxidation processes (O3, O3/UV and O3/UV/H2O2) in a pilot-scale bubble column reactor and process economics.” Separation and Purification Technology, 72(3), 235-241. 21. Rosenfeldt, E.J., Linden, K.G., Canonica, S., and Gunten, U.S. (2006). “Comparison of the efficiency of OH radical formation during ozonation and the advanced oxidation processes O3/H2O2 and UV/H2O2.” Water Research, 40(20), 3695-3704. 22. Nawrocki, J., and Kasprzyk-Hordern, B. (2010). “The efficiency and mechanisms of catalytic ozonation.” Applied Catalysis B: Environmental, 99(1), 27-42. 23. Waldemer, R.H., Tratney, R, P.G., Johnson, R.L., and Nurmi, J.T. (2007). “Oxidation of chlorinated ethenes by heat-activated persulfate: Kinetics and products.” Environmental Science and Technology, 41(3), 1010-1015. 24. Wang, W.H., Hoag, G.E., Collins, J.B., and Naidu, R. (2013). “Evaluation of surfactant-enhanced in situ chemical oxidation (S-ISCO) in contaminated soil.” Water, Air, and Soil Pollution, 224(12), 1-9. 25. Abu Amr, S.S., Abdui Aziz, H., and Adlan, M.N. (2013). “Optimization of stabilized leachate treatment using ozone/persulfate in the advanced oxidation process.” Waste Management, 33(6), 1434-1441. 26. Abu Amr, A., Abdui Aziz, H., Adlan, M. N., and Alkasseh, J. M. A. (2013). “Effect of ozone and ozone/persulfate processes on biodegradable and soluble characteristics of semiaerobic stabilized leachate.” Environmental Progress and Sustainable Energy, 33(1), 184-191. 27. Nagaralli, B., Seetharamappa, J., and Melwanki, M. (2002). “Sensitive spectrophotometric methods for the determination of amoxycillin, ciprofloxacin and piroxicam in pure and pharmaceutical formulations.” J. of Pharmaceutical and Biomedical Analysis, 29(5), 859-864. 28. Rahim Pouran, S., Abdul Raman, A.A., and Wan Daud, W.M.A. (2014). “Review on the application of modified iron oxides as heterogeneous catalysts in Fenton reactions.” J. of Cleaner Production, 64, 24-35. 29. Abu Amr, S.S., Aziz, H.A., and Adlan, M.N. (2013). “Optimization of stabilized leachate treatment using ozone/persulfate in the advanced oxidation process.” Waste Management, 33(6), 1434-1441. 30. Deng, Y., and Ezyske, C.M. (2011). “Sulfate radical-advanced oxidation process (SR-AOP) for simultaneous removal of refractory organic contaminants and ammonia in landfill leachate.” Water Research, 45(18), 6189-6194. 31. Yang, S., Wang, P., Yang, X., Wei, G., Zhang, W., and Shan, L. (2009). “A novel advanced oxidation process to degrade organic pollutants in wastewater: Microwave-activated persulfate oxidation.” J. of Environmental Sciences, 921(9), 1175-1180. 32. Ta, N., Hong, J., T.ingfeng, L., and Sun, Ch. (2006). “Degradation of atrazine by microwave-assisted electrodeless discharge mercury lamp in aqueous solution.” J. of Hazardous Materials, 138(1), 187-194. 33. Lin, H., Wu, J., and Zhang, H. (2013). “Degradation of bisphenol a in aqueous solution by a novel electro/Fe3+/peroxydisulfate process.” Separation and Purification Technology, 117, 18-23. 34. Wu, J., Zhang, H., and Qiu, J. (2012). “Degradation of acid orange 7 in aqueous solution by a novel electro/Fe2+/peroxydisulfate process.” J. of Hazardous Materials, 215, 138-145. 35. Sui, M., Xing, S., Sheng, L., Huang, S.H., and Guo, H. (2012). “Heterogeneous catalytic ozonation of ciprofloxacin in water with carbon nanotube supported manganese oxides as catalyst.” J.of Hazardous Materials, 227, 227-236. 36. Prieto, A., Moder, M., Rodil, R., Adrian, L., and Marco-Urrea, E. (2011). “Degradation of the antibiotics norfloxacin and ciprofloxacin by a white-rot fungus and identification of degradation products.” Bioresource Technology, 102(23), 10987-10995. 37. Zhang, X., Zhang, Y., Zhao, H., He, Y., Li, X., and Yuan, Z. (2013). “Highly sensitive and selective colorimetric sensing of antibiotics in milk.” Analytica Chimica Acta, 778, 63-69.